With Black Friday less than a week away, most retailers will have their action plans ready to go for what has become probably the most important shopping event of the year. 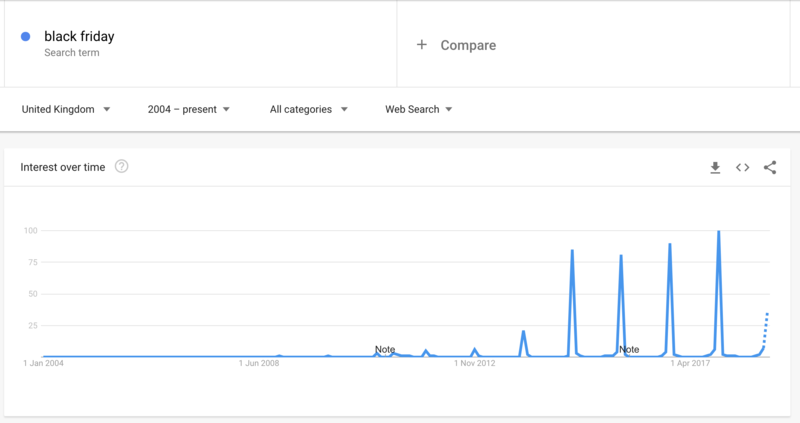 Whilst virtually unheard of outside of the UK until 2014 (as this Google Trends graph indicates) the North American holiday continues to grow in size and popularity. Last year, the UK’s online spending on Black Friday totaled £1.4 billion and grew by more than 11.5% compared to the previous year. According to the Office for National Statistics, in recent years the impact of Black Friday and Cyber Monday has been sufficient to shift the bulk of Christmas shopping from December to November. With these important days right around the corner, we’ve outlined some of the simple things you can still do in order to make the most out of these key dates in your sales calendar. SocialMediaToday says that around 87% of eCommerce customers have stated that social media plays an important role in helping them make their shopping decisions. The people who follow you on your social media platforms are the people most dedicated to your brand, and the people in all likelihood that you’d like to reward with VIP treatment. By giving your followers a sneak peak or preview of your Black Friday promotions or offering them exclusive coupon codes, you’re not only building anticipation for the big day, but you’re giving them a concrete incentive to follow your social media channels. While focusing on your current followers, don’t forget about those who have previously bought from you, abandoned their cart, or have purchased similar products to yours. You can easily reach this market by using paid advertisements on your social media platforms, a few days before Black Friday. Consider what formats of ads and promotions work best for each platform; easy to use design tools such as Canva have a range of templates you can customize and resize to work on all platforms. Making a little bit of extra effort before, during and after Black Friday can yield important dividends, and the entire holiday season is a great time for building anticipation for your brand’s upcoming season of products, as well as increasing engagement and followership on your social media channels. Your customers are likely getting many emails about Black Friday deals but don’t let this deter you from sending emails of your own! If they’ve signed up to receive your email marketing, you know they’re engaged with you as a brand and are likely to have purchased from you before. You may also be reaching other shoppers who are dedicated to getting the best Black Friday deals, and have subscribed to your newsletters and emails with this goal in mind. Though it is up to you and your brand to stand out from the rest of the competitor’s emails, there are many tactics, like providing exclusive promotional content or encouraging customers to make a wish list a week or two before Black Friday, so they can see which of their listed items are on sale in the days leading up to Black Friday. By reminding them of their list or sending them promotions when those pieces do go on sale, you’re offering a personalized recommendation that’s genuinely helpful and can help you earn the attention of your email subscribers. As online Black Friday shoppers are growing in size every year, it’s important to make sure your brand’s website is able to handle the surge in traffic that you’re likely to experience. There would be nothing worse than having your website malfunction the day of, due to your sites capacity limits or lack of ability to handle a continuous load of traffic. You may want to consult with your provider beforehand to ensure that your website can handle a spike in traffic and keep you safe from any vulnerabilities. Make sure you know what the process is should the site suffer any site malfunctions. For shoppers looking to score great Black Friday deals, speed and safety are key qualities that matter. Make sure your website is loading quickly, particularly on mobile; you can do a simple check using Google’s PageSpeed Insights tool, which will also identify a list of opportunities that will help you reduce load times. Google Webmaster Tools can also be helpful in ensuring that your content and images are optimized to provide a positive user experience on your site. This is also a good time to ensure you have all your tracking and reports set up; installing a heatmap tool can give you valuable insight on user behavior that you can use to optimize for other sale events. By checking and double-checking your IT infrastructure, you will insure a good experience for your online customers, no matter how busy your page gets. In 2016, the average eCommerce store lost about 77.24% of its sales to cart abandonment, and about 35% of these were due to a lack of suitable shipping options, a long or confusing checkout process, or having to create a new user account. With Black Friday deals often being time-limited, providing customers with easy checkout options is key to getting them to the end of the purchase journey. Having to register for an account, manually input lots of personal information or not being able to view all the delivery and payment options clearly can be real killer to conversions. 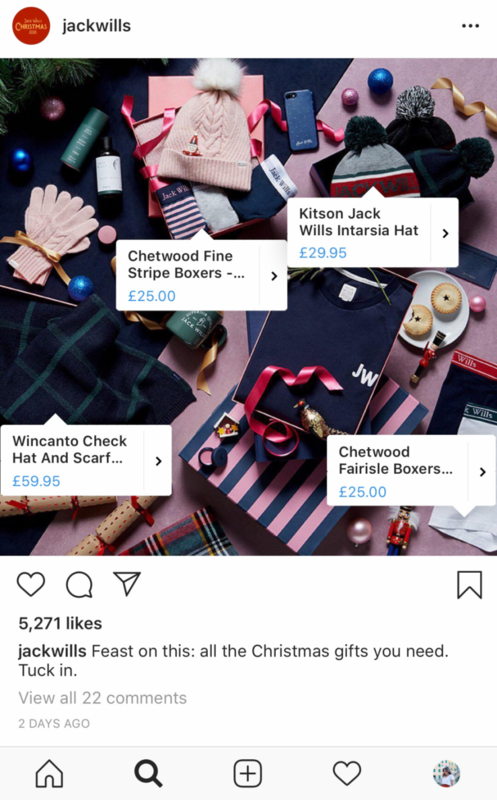 Though you’re already likely to have options such as guest checkout and address auto-complete enabled, giving your customers the option to ‘Buy now, Pay later’ can be crucial when they’re making a higher volume of purchases. So can offering local pick-up options so they can get their orders sent to a convenient location near them if they’re not at home to receive their parcels; dragging all the orders home on public transport can be a deterrent factor when it comes to making a purchase. By making the shopping and delivery process more efficient and satisfactory for the customer, which means less complaints on your end-it’s a win-win! Below is an example of an Urban Outfitters checkout, which gives the customer multiple checkout options and helps make the checkout process as easy as possible. Black Friday may be a big deal for shoppers and retailers alike, but the few days before and after are just as important. With Cyber Monday becoming more and more popular, it is not only important to focus on promoting your brand’s deals for the day of Black Friday, but it is key to be ready for the surrounding days. Not only do many ecommerce retailers start their promotions on Thursday at midnight, but many continue their deals, or release new ones, every day up to Cyber Monday, to capitalize on the many people shopping for the upcoming Christmas season. Another pro tip, if you want to start preparing for next Black Friday before this year’s events have even begun, is to leave up your Black Friday-dedicated page even after this year’s Black Friday activities end. This will only help ensure that your dedicated Black Friday and/or Cyber Monday page will perform better for those search terms in coming years. And finally – don’t forget you’re here to make the shopping experience as easy as possible for your shoppers. If it’s tedious or frustrating, they’re likely to look somewhere else. Don’t make the customers search for the deals within your promotional emails or website content, instead, create clear sections dedicated to Black Friday. Not only will this be more efficient for the customer, but it will be a more effective way of pointing the customers towards everything you are specifically offering for Black Friday sales and beyond.